A specially modified Chrome Monstrobot, built to withstand tough-to-remove stains caused by the insurmountable pollution and radiation within the Toxic Spill. The Polluted Chrome MonstroBot Skin can be used on the Chrome MonstroBot. The trap's stats (power, power bonus, attraction bonus, etc.) are not changed. The Polluted Chrome MonstroBot Skin can be crafted with the proper ingredients. The Polluted Chrome MonstroBot Skin can be traded on the Marketplace or through Give To Friends. 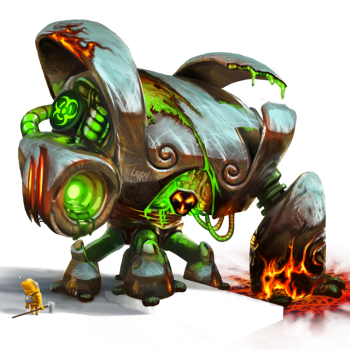 18 July 2017: The Polluted Chrome MonstroBot Skin was released as part of a Toxic Spill update. This page was last edited on 23 March 2019, at 08:14.